Stuga Microline available for sale after full refurb. We have a left to right feeding Stuga Microline that will be fully refurbished in our Gt Yarmouth factory and offered with the usual 12 months parts and labour warranty. The Microline is 13.5m x 2.3m and comes complete with label printer, dust extractor and on-board cameras for fault finding. 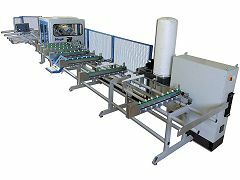 This very popular machine is one of our best selling pre-used models and can produce circa 350 windows per week. For full details, please see 'Microline' in 'Products' on the Stuga website. Please note: The library picture shown is right to left feeding. The machine we have is opposite to this and feeding from left to right. This machine will have the latest software updates installed, and can be seen by visiting our factory where Stuga always welcomes customers. Originally built in 2007 and under Stuga service ever since.